Those in Texas are familiar chant “Remember the Alamo!” For Bears fans, 2011 seemed like a great opportunity to “Remember 2004!” Even with the Super Bowl MVP and finishing second to probably one of the greatest teams ever (USC 2004), our Rose Bowl drought continued. What if JJ Arrington’s touchdown hadn’t been called back? What if Arizona State hadn’t lost to Arizona? What if Oregon State hadn’t missed 3 extra points against LSU? And of course what if Mack Brown hadn’t lobbied his way to the extra votes in the AP and Coach’s poll to bump Texas ahead of Cal? It seemed like a storybook closure to a dark chapter in Cal history. We had a chance to beat Texas in the Bowl game we were so unwilling to go to 7 years earlier. Unfortunately working against the Bears was the simple fact many of the current Bears were barely in 4th or 5th grade when the snubbing happened and the rally cry for 52 years of frustration wasn’t enough to carry Cal past a more obviously talented Texas squad. Yes, the Longhorns suffer from the same QB issues Cal does. But their creative play calling from Bryan Harsin and speed on defense was more than adequate to cover their deficiencies at QB. I’ll focus on a couple issues of why Cal lost the game. 1) Predictable play calling – I’m going to avoid the obvious 5 turnovers which doomed the bears. What was most irritating were they were not “hustle” or “fluke” turnovers from a player trying to stretch for extra yards or a batted ball. But a collection of terrible reads, missed exchanges, and inability to protect the ball while running. Of course it didn’t help that every other play was either a bubble screen play to KA21, Isi trying to get to the outside, or Maynard rolling to the left. It was pretty obvious Texas knew those were the “fallback” and “safe” plays were going to run and they did a great job to bottle them up. The Texas defense seemed to always be in the right place at the right time and I don’t think it was a coincidence. It was obvious by the 3rd quarter we weren’t going to beat the Horns to the edges and they knew how to defend the screens. I’m not sure why Tedford didn’t reach into his 110 plays he has saved up and call some pass plays/routes Maynard was most comfortable with throwing, because it was obvious ZM was rattled from the TOs. 2) Not capitalizing good field position – It seemed as a great opportunity to turn the game around after Texas’ unnecessary roughness followed by a sack pinned them to the 1. Marc Anthony also got lucky the receiver barely stepped out of bounds preventing a huge bomb on third down. Marvin Jones got a great return to the Texas 35. But somehow we moved backwards on 3 consecutive plays topped by an Anthony Miller unsportsmanlike conduct and the fumbled which was the turnover the Horns finally cashed in for 6. How we didn’t get at least points out of that possession is beyond me. Of course not having KA21 for a couple plays hurt, but there’s now reason why we should go from the Texas 35 to our 40 yard line in the course of 3 plays. 3) The “little things” – Bryan Angar will probably admit this wasn’t one of his better punting days. His shank to the 50 led to the first Texas touchdown when it appeared our defense was holding the clamps down. Marc Anthony gets beat deep by the fastest player on their team when there wasn’t any safety help over the top. The bobbled snaps by Maynard out of the shotgun. As a disclaimer, most of them appeared low, so I’m sure that will be a point of emphasis in the off-season. I’m sure the coaching staff will focus on these issues during the next 9 months and hopefully 2012 will open with a bang in the new Memorial Stadium in September. Categories: 2011 Season, Uncategorized | Permalink. – Texas appears to be trying to establish the run early. – Pretty fortunate ball was touched by a longhorn avoids a disastrous start for the Bears. – Maynard looks great converting 2 pivotal 3rd downs. – Great field goal to bail us out despite the penalties. – Our defense is swarming Ash, I wonder how much longer till we see McCoy. – Maynard isn’t moving the ball that much more effectively than Ashe, we have looked sloppy on our exchanges and hikes tonight. – Ugh , Angar shanks a punt. It’s so obviously now we are throwing too many bubble screens to KA21 and Maynard is always rolling to his left. – Wow defensive breakdown on the TE on that play gives Texas a huge boost. That was a pretty nifty trick play called by Harsin. – Great return is nullified by inability to gain much on first down. Our offense is moving backwards. Terrible we can’t even get a field goal attempt on that last drive. – Looks like this will be a war of attrition folks. Game will probably be won on field position. Categories: 2011 Season, In-Game Analysis | Permalink. As Spike Lee would say, "is it the shoes?" 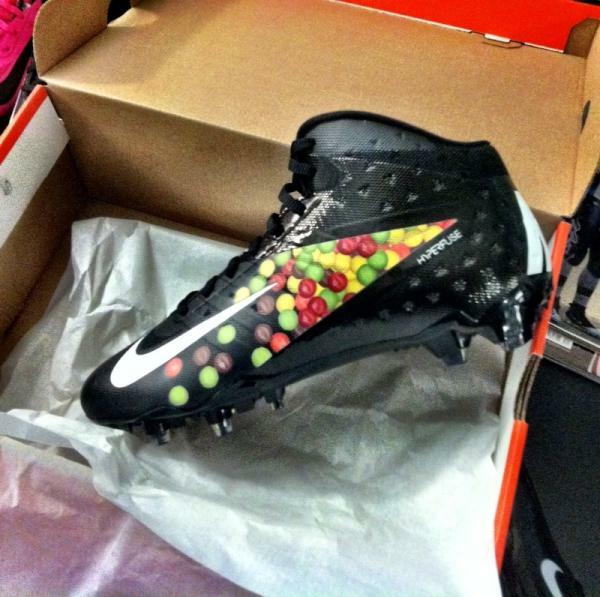 Marshawn Lynch has been sporting new skittles cleats which he claims give him superpowers. Beast Mode snapped San Francisco’s season streak of not allowing a rushing TD and was able to top 100 yards which was the first against the Niners since 2009. Lynch rewarded fantasy owners who started him in their Fantasy Football Finals and it will be a hot topic if he resigns with the SeaChickens in the offseason. DeSean Jackson caught 5 passes for 90 yards against the Cowboys to cap off a quiet, but effective game even though the Eagles knew ahead of time they were eliminated from playoff contention. Jackson realizes that next year is out of his control but he definitely wants return an Eagle next season. One possibility has Jackson going to Buffalo of all places? But needless to say, his punt returning skills itself still gives the Giants nightmares. 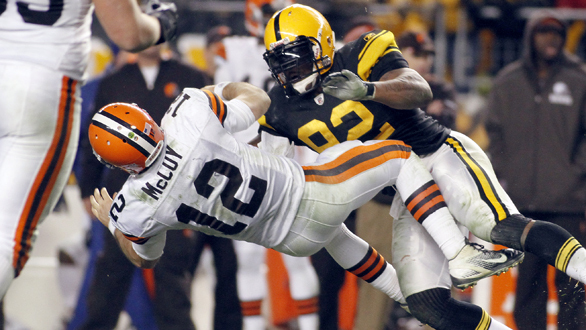 Alex Mack has been sticking up for his quarterback , Colt McCoy, and has accused Steeler’s James Harrison of headhunting. Cleveland’s offense has been terrible which might hurt Mack’s and Pro Bowler Joe Thomas’ stock as they approach free agency as they are rumored to file a lawsuit against the Browns? Mack has set a precedence for interior linemen to be drafted in the first round, as Stanford’s David DeCastro looks to be another first round interior lineman in the 2012 NFL draft as Mack and the Pouncey brothers were the years before. Cameron Morrah looks be active in the Seattle community as he helped honor a sixth grade teacher for her continual excellence and ability to teach kids, as she was nominated for the Seattle Seahawk’s MVP award for teachers. On the field, Morrah hasn’t caught a lot of balls, but has been instrumental in big touchdown plays against the Niners, the Rams, and Eagles – which included a big block against NFL sack leader Jason Babins. Thomas DeCoud is determined not to have Drew Brees break the single season passing record against the Falcon’s tonight on Monday Night Football. DeCoud feels as if the much maligned Falcon’s secondary is finally coming together as he collected another interception last week on Thursday Night Football, albeit against the lowly Jaguars. Shane Verren talks to Boston columnist Mike Reiss. Verren has been battling a hamstring injury throughout the season, but will look to see a portion of the workload come playoff time. Pac-12 is looking a very daunting bowl season this year, being dogs in 6/7 games. USC not playing, 2 BCS bowl teams bumps everyone up and coinciding with a bunch of bowl tie-ins with a strong Big-12, puts the conference in a tough spot. However a 3/7 bowl season with a BCS win or preferably a 4/7 season with 2 BCS wins would propel the conference immensely into its sophomore season. Arizona State 24 Boise State 42 – ASU’s best player is a linebacker who can’t keep his head on straight. Boise’s best player is a quarterback who always seems to rise to the occasion. Advantage Broncos. California 26 Texas 21 – I believe Giorgio will kick the Bears to a victory in a game where special teams plays a key role with two inconsistent offenses. Washington 34 Baylor 45 – The “other” Bears put up more points in a shootout where RG3 cements himself as the second QB taken in the draft after Matt Barkley’s announcement that he’s coming back for a senior season. Utah 23 Georgia Tech 17 – I have strong faith in Kyle Whittingham’s ability to coach these big games (sans Boise State last year) and Norm Chow’s ability to draw up schematic plays to move the football in a conservative offense relying heavily on John White IV. With ample preparation, the Utes should have strong clamps on Paul Johnson’s triple option attack. UCLA 30 Illinois 27 – The Bruins continue their tradition of jumping the wall on Tuesday and will lose 3 seniors due to academic ineligibility but I believe the baby bears somehow pull this off in the Bay. Oregon 24 Wisconsin 30 – I have been burned by Oregon too many times. Boise State, Stanford, Ohio State, Auburn, and LSU have all been able to stop the Ducks with ample preparation time. The Ducks need this game for validation much like Ohio State did in the 2010 Rose Bowl. Stanford 38 Oklahoma State 30 – Hard to bet on the best player in the game. In addition I think the difference will be the run game of Stanford with two future 1st round prospects on the OLine, bashing Stepfan Taylor down the Poke’s run defense ranked 110+ in the country. A bit optimistic on my picks. It would be nice if Oregon can get over the hump. 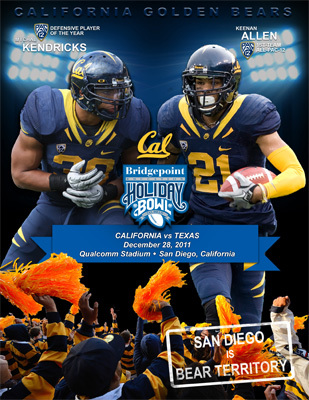 Categories: 2011 Weekly Predictions, Pac-12 Overview | Permalink.